This 53-year-old male patient presents with pain and catching of the right shoulder when lifting the arm above the head. You are shown proton density fat suppression sequences using STIR short T1 inversion recovery in the coronal and sagittal projections. The patient has a rotator cuff tear. Q1 – Is the tear full thickness? Look at the blue arrow on image 1 before you make your decision. Q2 – When you have made your decision in question 1, check out images 2 and 3. Note the additional pink arrow on image 2, as well. What do you think the blue arrow represents? A1 – The tear is not full thickness. It appears ominous and perhaps full thickness in the coronal projection (image 2, pink arrow), but that is because the outer shell fibers are curved and “en face” to the coronal image. 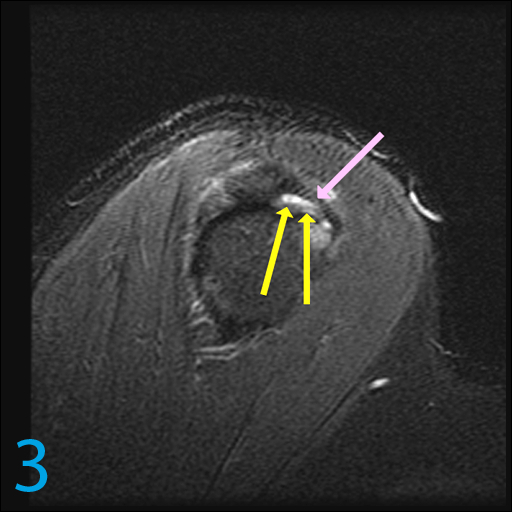 However, in the sagittal projection (image 3), a clear hypointense outer shell (pink arrow) covers a partial thickness tear (yellow arrows). This is a terribly important teaching point, namely that full thickness tears should appear to communicate with the bursal space in two projections. 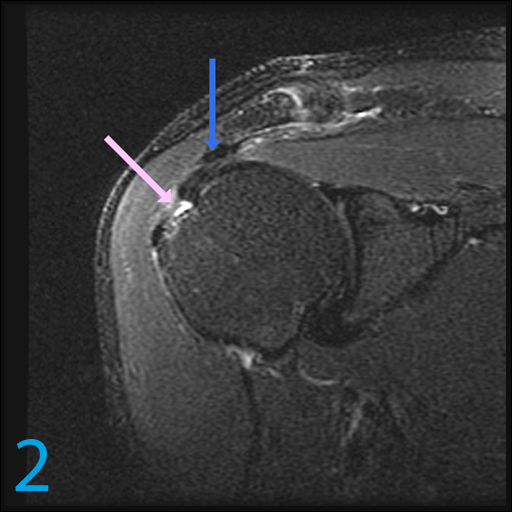 The outer low signal shell (image 3, pink arrow) confirms this in the sagittal projection. Additionally, the patient had surgery affirming the presence of a partial, not full thickness communicating, tear. A2 – The blue arrow (images 1 and 2) points to the hypertrophied markedly thickened coracoacromial ligament which is often responsible for outlet related stenosis and clinical impingement syndrome. When the patient abducts, the rotator cuff comes in contact with the acromion and thickened coracoacromial ligament where it is repetitively “pinched” or impinged, especially in internal rotation.